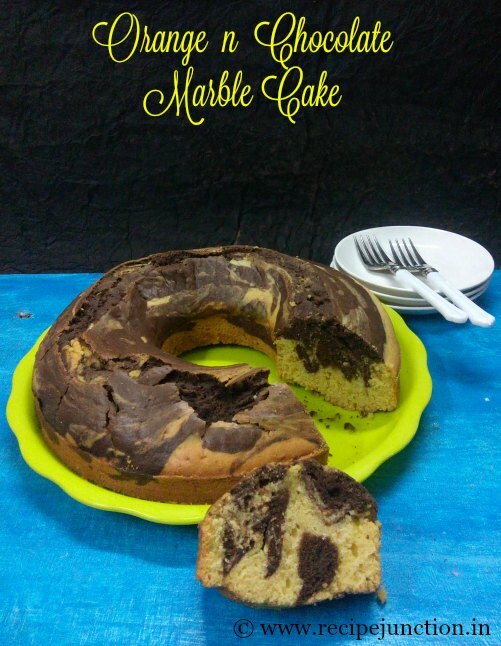 Kids always gets fascinated with marble cake and my kids love them because of their beauty. they demand now and then. 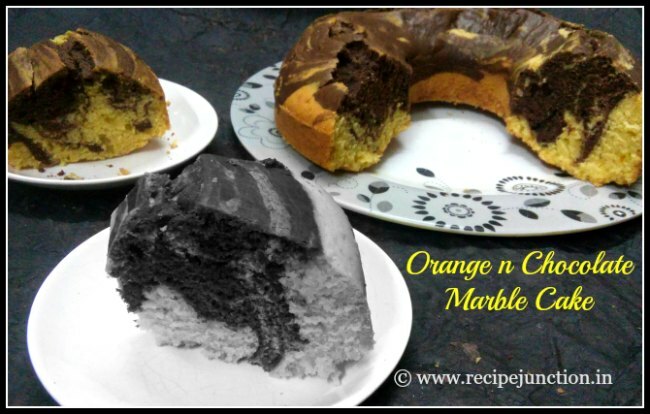 I always wanted this Orange and chocolate marble cake to try, but somehow it never happened. this season I made my mind to make it for my kids before the season ends. I made the cake with freshly squeezed orange juice. It gives the fresh orange flavour. Do try this awesome flavoured cake before the fresh oranges vanish from market. Baking Powder : 11/2 tsp. Orange essence : 1 tsp. Orange zest : 1 tsp. Preheat your oven to 180 degreeC. Squeeze out juice from 2 medium/big oranges. Use the zest from the orange peel. keep aside. In a bowl, mix app purpose flour, baking powder, baking soda and salt and mix everything well. keep aside. This is your dry ingredients or flour mixture. In a big mixing bowl, beat butter and egg together. Add sugar and beat until creamy. Add orange zest, vanilla and orange essence in there and mix with a ladle. Now add the prepared flour mixture little by little in the batter and mix well. Keep adding orange juice to mix the batter. After adding all the flour, if the batter looks dry, add in milk as much needed to make the batter creamy. Beat for 2-3 minutes in high speed. Your batter is ready. Divide the batter in 2:1 or 1:1 portion(choice is yours). In small portion, add the cocoa powder and mix well. SO, finally you have one white batter and one chocolate batter. Take a bundt pan or any other baking pan, grease it well with oil or butter. Now pour the white batter first evenly on the pan, then pour the chocolate batter over it. 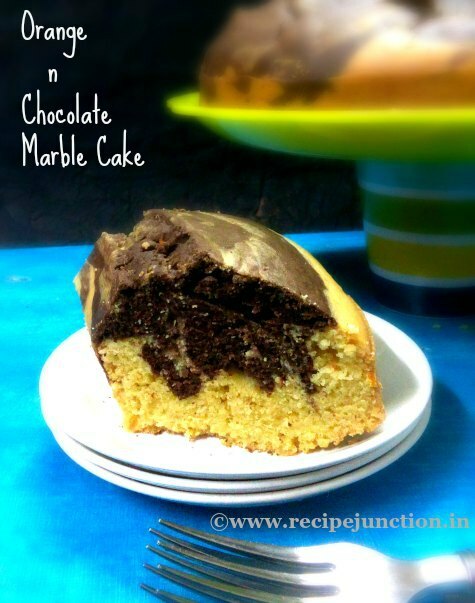 Now with a ladle or spoon, give a quick stir, so that both the batter get a marble effect. Now put the pan in the oven and bake for 45-50 minutes or a toothpick inserted in the center of the pan, comes out clean. Never fill a baking pan till the rim. Always keep 1/3 space or more of the pan empty. keep all your baking ingredients in room temperature unless stated in the recipe. It's very important.